Life in a police station (PS) can be very interesting especially when one is not at any receiving end. Everyone knows me and my wedding procession as living inside the local PS, Sultanpur Lodhi. I remember having taught more than 70 students last May and when the first event at the Qila was hosted by the Anad Foundation in collaboration with district and police administration, Kapurthala the turnout was a paltry 220 odd. There were 23 poets and the event conducted was by celebrated poet Surjit Patar. One cop, who happens to be one of my students, just came apologetically and told me about his moment, one of yesterday, of huge embarrassment. One guy from the neighbourhood was caught stealing about 32 rupees from a sadhu. The current SHO (who is such a darling actually and who once studied music from Professor Tara Singh of Gwalior gharana), according to my student, is tough and hence thefts, these days, are on a decline in their area. The thief was at the receiving end of some sound beating that, from what I hear, came served on the house. 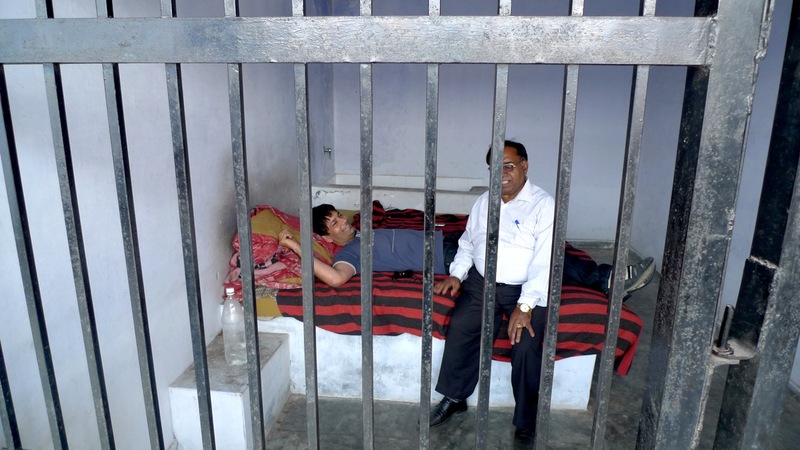 My student cop, who had the thief in his custody got busy talking to a colleague and this thief opened a window (he was not in the cell as singer Jasbir Jassi in the photo) and sneaked out, climbed on a confiscated truck (from the times of Prophet Adam) on to the wall of the that particular PS. Witnessed by a few, he seemed to weigh the cons for a long time and then jumped outside (bravo) in the jungle and escaped.